In the aerial arts, people hang from the ground and if it goes wrong it can be serious. When you looking at joining a studio, you need to look at the saftey factors they have in place to protect you. What is a saftey factor? The “extra” saftey built into their equipment that goes above and beyond the rated value to account for unknowns. For example: If you have an apparatus that is rated for 100 pounds (to keep the math easy) and a 80 pound person uses it, is it safe? Seems like it would be. But what if the apparatus is a fabric that was hanging outside in the sun for 5 years and has weathered. Can it still take 100 pounds? Likely not. But how do you know? How can we calculate it? We can’t. That is where the saftey factor comes in. A saftey factor accounts for the unknowns or things we can’t quantifiably calculate. In the aerial arts there are a LOT of unknowns for what we do so we tend to have HIGH saftey factors. A minimal saftey factor across the industry when hanging a human is 5:1 (7:1 make me happier…). So for that 100 pound apparatus we actually expect it to hold at 500 pounds (100 pounds x 5 saftey factor). The extra x5 saftey factor gives wiggle room for the things we don’t know before plummeting to our deaths. Why does this matter? Oh look, here’s a pretty building and I want to hang people from it. Ok. Is it structurally sound? An engineer can tell you that. But will it remain structurally sound after countless drops and jarring loads? What about snow load in WI? What is the history of the building; was it ever mistreated, had fire, was twisted in the wind or is there amy damage unseen? This was an issue I had to deal with when expanding in my existing building to include aerial. I had the options of “sure up” the existing structure in my space or spend a Sh*T ton more and build my own structure. I opted to build an expensive free-standing steel structure instead of using the existing structure because I KNOW it can’t fail. There is no chance for any pre existing issue I haven’t detected, like a rotting wood beam or a previously overloaded steel beam from the 1982 snow storm, becoming a factor in the future. There is no chance that anything I don’t know about from before will play into the saftey of my students. There is no question as to the capabilities and continued use of the structure because I paid an engineer to design it, I had it constructed, and I know how it has always been used. You can sure up a building all you want, but at the end of the day you will never with 100% certainty know that it will react as expected. It was a VERY expensive choice I made. Do I wish I didn’t have the debt, often, but I also KNOW that there is almost no way I can have a structural failure. And on top of that, my structure was engineered with a saftey factor of 10:1. Meaning that each attachment point was built for 2,200 pounds as per my specs to the engineer and was then given a x10 margin for unknown error. So EVERY attachment point in my aerial studio (of which there are 10 per beam) has a 22,000 pound capability before failing. Meaning each beam has 220,000 pounds before danger. I can confidently say, that means you’re safe when hanging from my structure….and feel free to hang your car too. 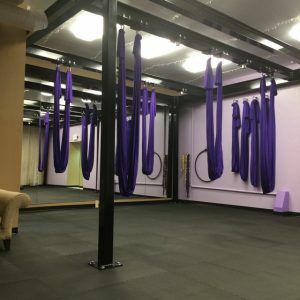 So as you look at joining a studio for the aerial arts you need to ask yourself what is the saftey factor that you are comfortable with? When in doubt, a higher saftey factor means less of a chance that your neck will pay the price.